Samsung Smart TV adds Ministry of Sound app | What Hi-Fi? Samsung has teamed up with Ministy of Sound for its latest Smart TV app, giving users access to music and video content, plus live music streams from the legendary nightclub. The Samsung Ministry of Sound app will also showcase exclusive interviews and behind the scenes footage from the worlds biggest DJs. The app makes the most of the latest Samsung TV's interactive features, with viewers able to use voice and gesture controls to browse the MoS music, radio and video library. You can also share content from the app between your TV and any Samsung Galaxy tablets and phones. The video section of the Smart TV app promises to be constantly updated, giving viewers the chance to see behind the scenes footage of their favourite artists, while the Radio section will give listeners the chance to listen to live DJ sets being performed from the London club itself. James Garside of Ministry of Sound said: “We're looking forward to giving dance music fans a taste of Ministry of Sound direct to Samsung Smart TVs. Live From The Club on Ministry of Sound Radio is a unique offering that allows users to stay in tune with the world famous DJs that play here." 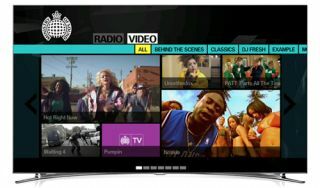 The Ministry of Sound Smart TV apps is available on all 2012 and 2013 Samsung Smart TVs.